The Bürkert Type 8619 multiCELL controller has always delivered exceptional multi-channel measurement and control for a range of sensors. Now, with the addition of Ethernet connectivity, the next generation of multiCELL aims to reduce installation time and vastly improve the connectivity of the control network. PIF explains all. With direct connection of a wide range of sensors to measure parameters such as flow rate, pH, ORP, temperature and conductivity, the Bürkert multiCELL Type 8619 is ideally suited to the control and monitoring of water quality in industrial processes. Designed to provide flexibility and an easy-to-use interface, the Bürkert multiCELL can be easily configured to suit a wide range of process control systems. As more and more control systems start to integrate Ethernet communications, so Bürkert is adding this important communication tool to many of its products. The continued implementation of this technology is making it considerably easier to install and operate process control infrastructure. The initial product release by Bürkert will enable communication using Modbus TCP and this will be shortly be followed by the introduction of PROFINET and Ethernet/IP capability. This will greatly simplify the connection between the multiCELL and the PLC as well as removing the need for an additional I/O card in the PLC. Each controller can be configured for a range of sensors, as well as having up to six pre-configured I/O boards to accommodate any signal requirements. In addition, the Bürkert multiCELL can be configured as a data logger, using the built-in SD card slot for data storage. This SD card slot can also be used to save sensor parameters and control application settings. This allows the same settings to be replicated in another multiCELL controller, ensuring accurate transfer of control parameters between sites. Sophisticated electronics and state-of-the-art control algorithms ensure that optimum process control is maintained at all times with minimal operator intervention. Chemical dosing pumps or control valves can be controlled via pulse, on/off or analogue signals, depending on the application in question. The adaptability and versatility of the Bürkert multiCELL 8619 allows it to be integrated into a variety of applications, from the very simplistic to more complex designs. Monitoring and maintaining water quality within an industrial process requires an array of sensors, flow meters, pumps and control valves. By introducing the highly functional Bürkert multiCELL, all of these components can be easily configured with parameters being set at the touch of a button. 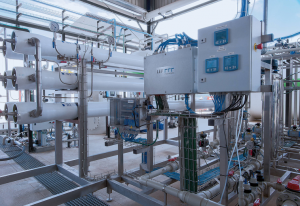 In many cases, maintaining precise control over the quality of water within a process is a fundamental requirement. At the same time, improved communication and flexibility can go a long way to reducing downtime and maintenance costs. For more information about the Bürkert multiCELL Type 8619, please contact Bürkert today.